A fter several weeks of hearing name over and over in different circles of friends, I decided it was time to check this place out. 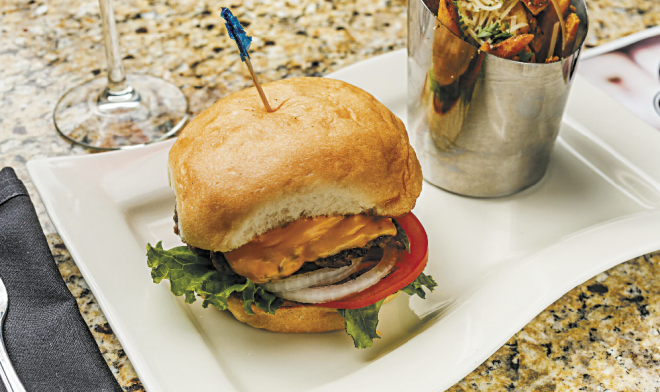 Located at the corner of Youree Drive and Flournoy Lucas Road in a brand new building, The Port Grill has an expansive menu with a little bit of everything. If you’re wanting to try something special that gives you a taste of multiple menu items in one visit, try The Chef’s Table. We were among the first diners to experience The Port Grill’s Chef Table. The Chef’s Table is an opportunity to have your appetizers, salads, entrées and desserts chosen by Chef George Beaird, a classically trained chef who has worked at restaurants in Nashville and several restaurants in the Shreveport- Bossier area. 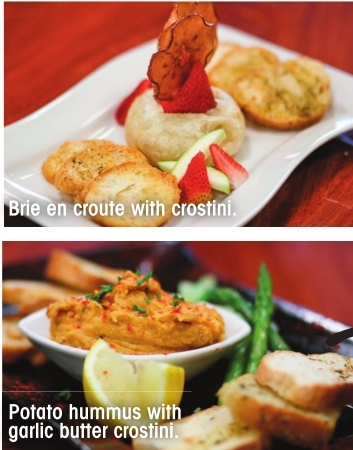 For appetizers, we tried the sweet potato hummus with garlic butter crostini. I could’ve stopped there, but they also brought us the Brie en croute with crostini – which is Brie baked with apples wrapped in puff pastry – and I really could’ve stopped there, but then they brought us the house-smoked pork shanks with orange balsamic barbecue sauce. That dipping sauce was like no other dipping sauce I’ve ever had, and I am a dipping sauce expert. For our second course, we were served the quinoa salad on mixed greens with dried fruits and house-made honeylime mint dressing. The dressing had a very unique, refreshing flavor. We also tried the spinach salad with red onions, bacon, candied pecans, strawberries and bleu cheese with honey balsamic vinaigrette. Both salads are winners in my book. Then it was time for the main course. The shrimp and grits is a hearty portion of seared shrimp in Creole sauce, served over some of the cheesiest (in a good way) smoked Gouda grits. There was also a bone-in grilled pork chop, topped with bourbon and brown sugar-glazed figs. They should bottle that glaze so I can pour it on my pancakes at home. While I’m not a fan of Brussels sprouts, when you top them with bacon and balsamic vinegar, they’re actually really good. As if that weren’t enough, there was also a slider version of their big hamburger, made with a house blend of ground chuck shoulder and sirloin that was very flavorful with a spectacular bun. As you can imagine, we were mostly full by this point, but as not to be rude dinner guests, we were able to eat some dessert. There were a trio of offerings: house-made bread pudding with vanilla rum sauce (should also be bottled so I can pour over my pancakes at home), tiramisu and a delectable slice of cheesecake with strawberry glaze turned on its back, towering high above the plate. We were also served a glass of Messina Hof Angel Heavenly Sweet Riesling with our dessert. The Chef’s Table will vary according to the day and season, allowing guests to visit multiple times without getting the same experience twice. Sound great? I thought so. Here are the details you need to know: minimum of four patrons per reservation, and your reservation must be made one week in advance. Hours: Sunday–Thursday 11 a.m. to 10 p.m. Friday & Saturday 11 a.m. to 11 p.m. Happy Hour is from 3-6 p.m. and features half-off all draft beer and wine by the glass.